I have three horses. Three lovely horses with significantly different conformation and dispositions. With all the rain that we have had this year the bugs are horrific. There is a tremendous amount of standing water around which is a mosquito breeding haven. 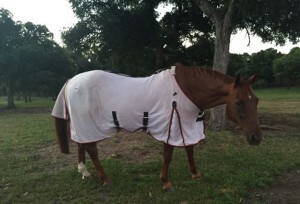 Therefore my horses all need fly sheets like they have never needed fly sheets ever before! Jaguar always gets one because his big ol’ belly gets crusty every summer from flies and such making a meal of his poor defenceless underparts. Sterling is the luckiest because he’s less desirable to the blood suckers due to his light coloured coat. This summer has been an exception so I’m using it as an opportunity to try some different types and brands of fly sheets. This is going to be a summer-long review of sorts. By the end of the summer I’ll know if I’m going to buy the same brand again for the same horse, if I need to replace any due to fit and durability issues, and finally if any of them are just too hot for Texas summers. 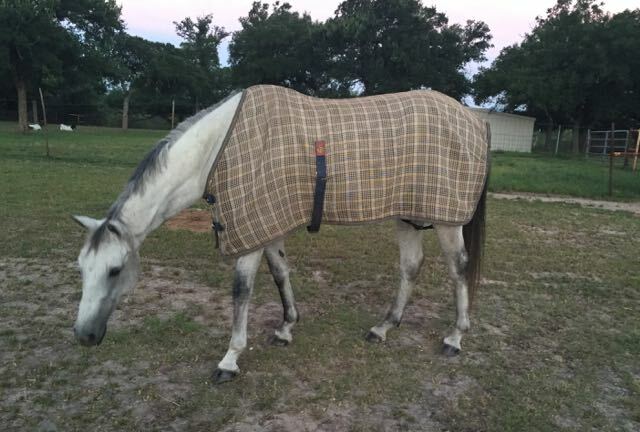 Jaguar got a brand new Weather beta Airflow fly sheet at the end of last summer because his old one was super stretched out and nasty after he wore it for two summers. He has to have the belly band option and it seemed to fit him just fine. He doesn’t have too much of an issue getting welts from bites so I didn’t think he needed a neck cover. I’m already a little worried about the fit of this one, though. As he ages his back drops and his withers become more prominent. His Weatherbeeta seems to be rubbing his wither area more than the same brand sheet did last summer. He doesn’t have any sores or show discomfort when he wears it so only time will tell. He’s also not too terribly hard on his clothing, but Coco likes to chew and tug on parts so it needs to be durable. 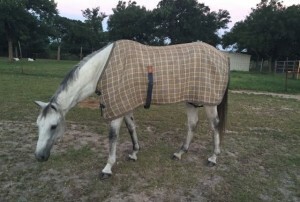 Sterling has a lovely traditional plaid Baker fly sheet. I’ve had a couple of these in the past and they have always been incredibly durable and fit well. Sterling is narrow, but not exceptionally so. His sheet doesn’t have any fancy options like neck covers or belly bands, but like I mentioned before he has the advantage of being a light color so less appetising to the bugs. He doesn’t get welts or runny eyes from bugs congregating on him. He’s good with his basic fly sheet and some fly spray most days. And I’d be lying if I didn’t admit that I just love the classic look of all the Baker horse clothing. Sterling always ALWAYS rolls at least twice while he’s turned out, so his clothing needs to be secure enough to stay put during and after he rolls. Other than that, just the usual Coco munching. Coco has already ruined one fly sheet this “summer”. It wasn’t her fault really. I got her a 76″ Baker fly sheet and it was just too big. 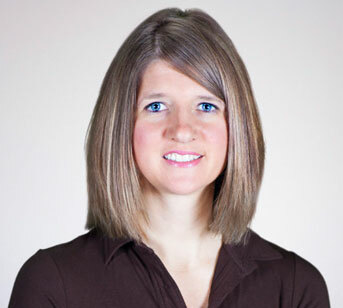 It ended up tearing just behind her withers, at the same spot where the surcingle around her belly connects. Rather than replace hers with a Baker I got her a 74″ Fly Turtle. I’m always hesitant about buying her sheets and blankets that fit just right. She’s only three and I know she’s going to grow and change shape for the next couple years so tend to want to buy ones that give her room to grow into. However with the Baker fly sheet that was a bad ide. The reviews of the Fly Turtle are spot on for her needs. They are supposed to be super cool, super durable and provide excellent protection from all bugs. It also has a removable neck cover which I think she needs. She tends to come in at night with her exposed parts covered in hives from bug bites. I’ve only put her out in the sheet so far. I wanted to be sure it fit well and didn’t shift too much before putting on the neck cover. 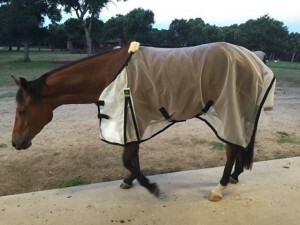 The Fly Turtle has a stretchy neck opening with a huge velcro closure as well as two straps on the front, two stretchy belly surcingle straps and stretchy hind leg straps plus a removable faux sheepskin wither protection pad. I’m quite impressed with it so far. It even came with an extra wither pad, surcingle strap and leg strap. Color me impressed! Coco is the easiest on her clothing because she chews on everyone else’s. I have noticed her being quite itchy this summer so she may test the durability more than usual. Coco doing a terrible job of showcasing her Fly Turtle.